This Hearthstone update introduces pre-purchase for Hearthstone’s newest expansion: The Witchwood! This patch also introduces Arena gameplay updates, including all-new Arena exclusive cards that were chosen by the crowd at BlizzCon. We’ve also laid the groundwork for the new Hearthstone Year, optimized loading times, and fixed several bugs. Prepare to join brave heroes as they embark on a hunt for the source of an eerie curse in Hearthstone’s newest expansion. Read the official blog for more details! 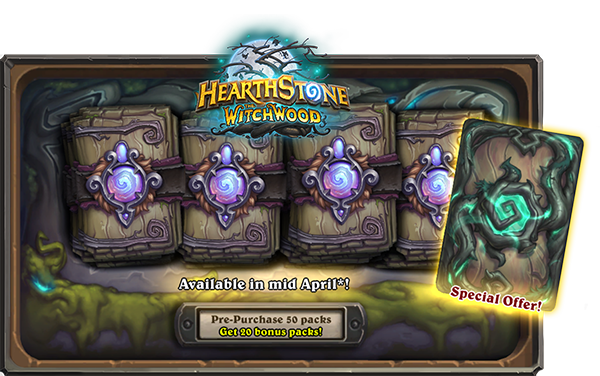 Pre-purchase now to receive 50 The Witchwood card packs. 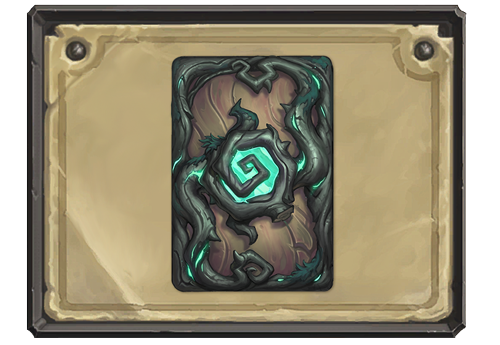 You’ll also receive the In a Dark Wood card back and 20 more The Witchwood card packs as a bonus! Use your new card back right away, and you can look forward to opening 70 card packs once the expansion arrives! We’ve prepared a special event for you to celebrate the upcoming Year of the Raven! More details to come soon! 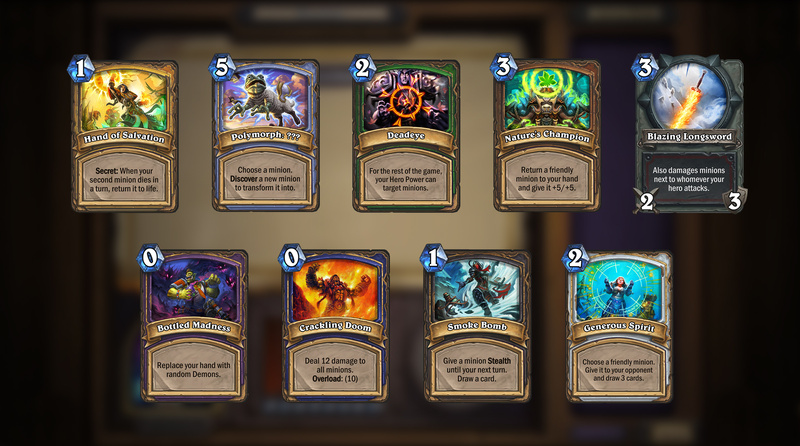 We’re trying out a new Arena format to make choosing cards more interesting and skill testing. New Draft Rules: Each pick in an Arena draft will now feature 3 cards of relatively equal power level, but mixed rarities. Picks 1, 10, 20, and 30 will continue to have a guaranteed Rare quality card or better. The increased chance to draft cards from the most recent expansion has been removed until the launch of The Witchwood. New Arena cards chosen at BlizzCon are being added to the Arena for a limited time. All cards that are excluded from the Arena draft pool remain unchanged. All the other existing Arena rules in place that affect appearance rates are unchanged. Hearthstone now loads faster on many devices. Fixed several minor UI and visual issues. Players can now create Blizzard Battle.net accounts via Facebook. Rakanishu now correctly displays in history during the King Togwaggle Dungeon Run encounter. [Mobile] Alternate Heroes that you do not own should now display their names in the Collection Manager. [iOS] Due to changes in iTunes, it will no longer be possible to purchase one-time only items for multiple Blizzard accounts from a single iTunes log in. Each account holder must log into iTunes separately to make those purchases. [iOS] Older iOS devices are now more stable when changing menus.